“It’s tremendously gratifying to witness not only the the profound impact made at the celebration weekend, but also the enduring influence this program has on many of these young musicians as their careers develop,” said John Wittmann, Yamaha. 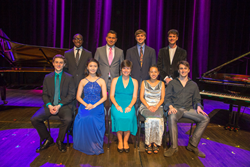 Celebrating some of the country’s brightest young musical talent, the 28th annual Yamaha Young Performing Artists (YYPA) Program was held June 25 – 28, 2016 at Ball State University in Muncie, Indiana. There, Yamaha Artist Services Indianapolis, in conjunction with the Yamaha Band and Orchestral division, presented its outstanding roster of 2016 YYPA Competition Winners. Underscoring the company’s commitment to music education, the annual YYPA program recognizes exceptional and emerging musicians in the jazz, classical and contemporary genres. The winning musicians demonstrated technical skill and artistry in a variety of musical instruments, including brass, winds, strings, percussion and piano. Hyerin Kim – Flute, Cherry Hill, N.J.
Ivy Ringel – Bassoon, Hillsborough, N.C.
Justin Sales – Saxophone, Mounds View, Minn.
Henry Solomon – Saxophone, Palo Alto, Calif.
John Paul Powers – Tuba, Clinton, Tenn.
Rebekah Ko – Marimba, Torrance, Calif.
Wickliffe Simmons – Cello, Atlanta, Ga. These winners received an all-expense-paid trip to the YYPA Celebration Weekend (June 25 – 28), which included workshops and clinics designed to help them to support their developing artistry, as well as launch a professional career. They also enjoyed global media exposure via the Internet, as well as a once-in-a-lifetime opportunity to perform in front of thousands at the annual YYPA Concert, on Monday, June 27th at Emens Auditorium. There, the winners shared the stage with world-renowned trumpet soloist and Yamaha Performing Artist Rex Richardson. The 2016 YYPA Winners join the pantheon of more than 200 talented musicians who have been recognized since the program’s inception. Many of these musical artists have established successful music careers, both as performers and educators. These include: Ricardo Morales, principal clarinet of the Philadelphia Orchestra; Alex Han, saxophonist with Marcus Miller; Otis Murphy, professor of saxophone, Indiana University; Conrad Jones, principal trumpet with the Indianapolis Symphony; and Aaron Parks, jazz pianist and Blue Note recording artist. For more information about the Yamaha Young Performing Artists Program, email jgascho@yamaha.com or visit: http://4wrd.it/YYPA.